In the region of Campania, in the Naples area to be more precise, it is in the habit of preparing the stuffed roll of meat sauce for Sunday lunch. When I was at my parents' house I ate it often but since I got married and moved I lost a little bit this culinary habit, with the exception to rediscover it as often as I visit my parents and, since my husband tasted it, I also prepare this meat sauce at my house on Sunday every once in a while. Then, in addiction, my mother-in-law, partly for lore and partly for her habit, is used to prepare fresh pasta for Sunday lunch, therefore, she gave me for the wedding both the machine to roll out the pasta and the guitar, which is not a musical instrument but a tool to prepare a particular type of spaghetti tipycal of Abruzzo, and that is the reason why I also prepared spaghetti alla chitarra and I assure you that this combination is delicious. 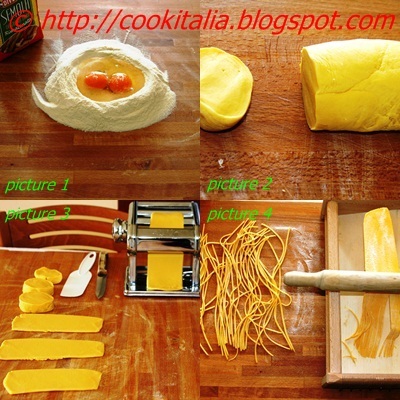 In the following recipe I have also included dosing to make pasta, but if you do not have the guitar ... you should go to the supermarket and buy ready-made spaghetti alla chitarra, which are still very good! Pound the slices of beef flat by using a meat mallet, sprinkle with chopped parsley,chopped garlic, the pine nuts, the raisins,salt, pepper and the nutmeg. 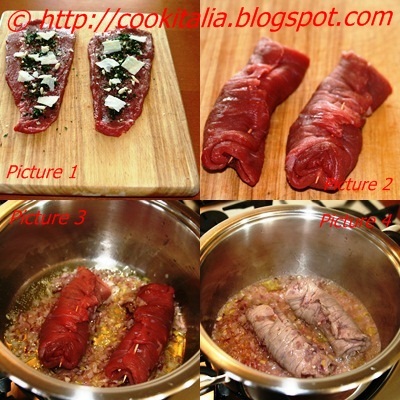 Now add the shaved Grana or pecorino cheese ( picture 1) and then make a roulade. To keep them sealed, just insert a toothpick at the ends ( picture 2) or tie them on. Cook for about an hour and a half over low heat, covering the saucepan at first and then after take the lid off to reduce the sauce. 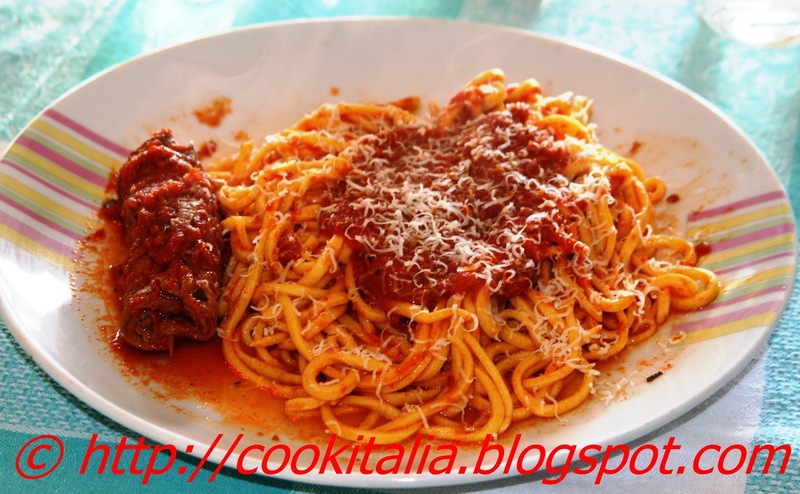 In a large pot bring to a boil salt water, cook the spaghetti, drain them and season with the sauce. Serve into dish adding the meat roll. Bon appetit!